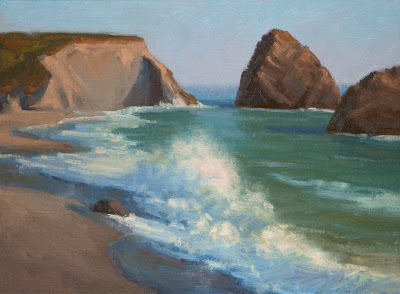 From a study painted near Jenner late one afternoon near sunset. I think that this was the time that a wave sneaked in and carried my painting pack into the surf. I managed to retrieve it but had a heavy, wet and sandy pack to carry back to the car in soggy sneakers. Oil on Linen, 16x12".